Wondering what where to eat in Yogyakarta? 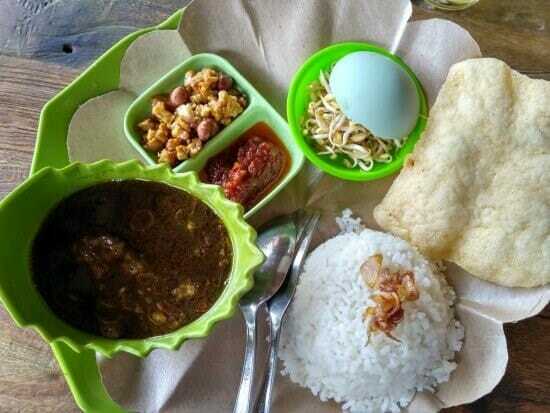 Check out this list of the top 9 Indonesian cuisines you can find in Yogyakarta. Bon Appétit! 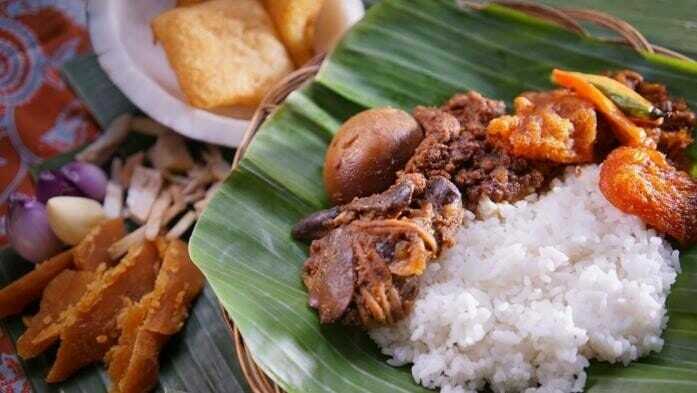 Gudeg is a dish that is unique to Javanese cuisine, which is requires one to cook a jackfruit for many hours with sugar, spices, and coconut milk. Make a visit to Gudeg Yu Djum the top restaurant in Yogyakarta where they insists on producing the Gudeg by hand. The result? Extremely tasty, flavourful and sweet Nasi Gudeg! 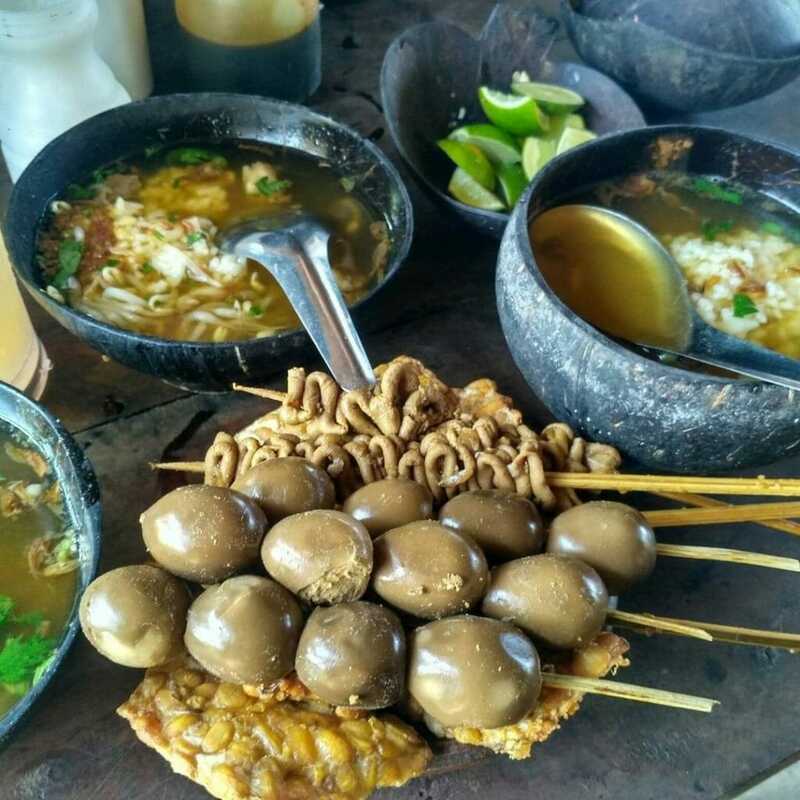 A must-try when you are in Jogja! 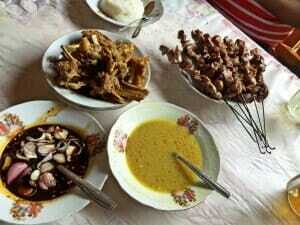 Sate Klathak is a satay that uses goat meat. For those who enjoy kambing, should give this a go, as this restaurant uses minimal seasoning to bring out the best flavour of the meat. Instead of using bamboo skewers, Sate Klathak Pak Pong uses bicycle bars to ensure the meat is thoroughly cooked! 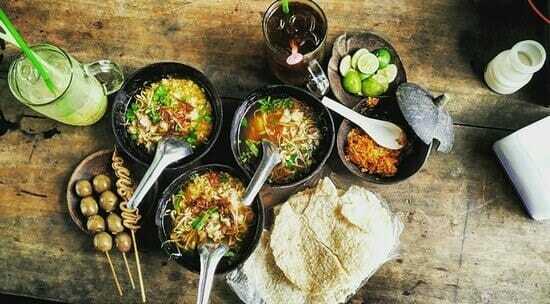 Soto is a breakfast staple for the locals and one must try soto served in a coconut shell at Soto Bathok Mbah Katro. This restaurant is also located in the midst of a Jogja rice field, giving you the au-naturale experience of having a meal. The little bowls also meant that you could control how much to eat, and is great for tiny eaters. Besides the delicious soup, this restaurant also serves intestines and quail eggs that you can add as sides to complete you meal! One cannot leave Indonesia without having Bakmie! These delicious noodles come in soup and fried styles where you can pick which you’ll prefer. This restaurant also provides live music by local artists every night. If you’re looking for an authentic Javanese experience, head over to Bakie Kadin! Do head there early as they are often packed and a long queue forms during dinner! While strolling around Malioboro at night, and your stomach starts to grumble, head over to try Burung Dara Goreng SBTB’s fried pigeon! This popular place only opens at 9pm after the shops close. 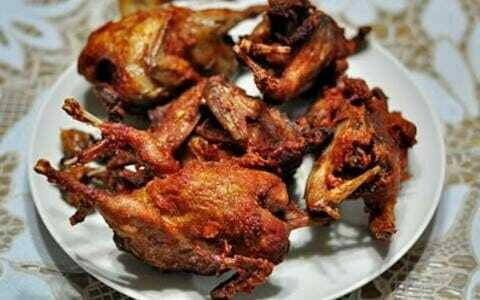 Don’t expect a 5 star hotel when eating this fried pigeon as this is more of a roadside store. Bring along some dettol wet wipes because you won’t stop until you’ve finished every part of the succulent meat! 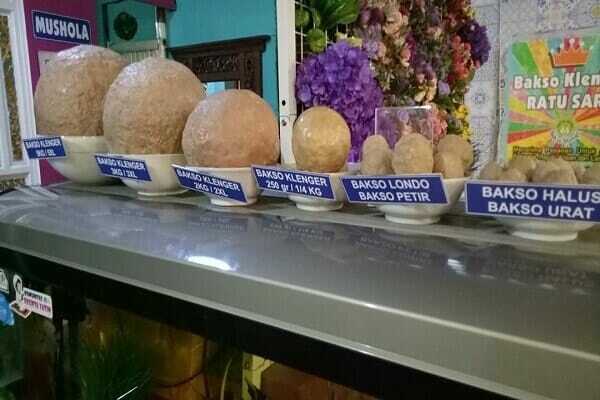 We all know that Bakso is a popular dish in Indonesia, but have you seen Yogyakarta’s Giant Bakso? Bakso Kelenger serves a variety of supersized beef meatballs. The Bakso is serve in a savoury beef sauce and you can choose to have it along with noodles and dumplings. You’ll also have a surprise when you cut the giant meatball, as it is filled with smaller meatballs, and beef veins. Bebek Goreng Haji Slamet has chains all over Yogyakarta and Indonesia. 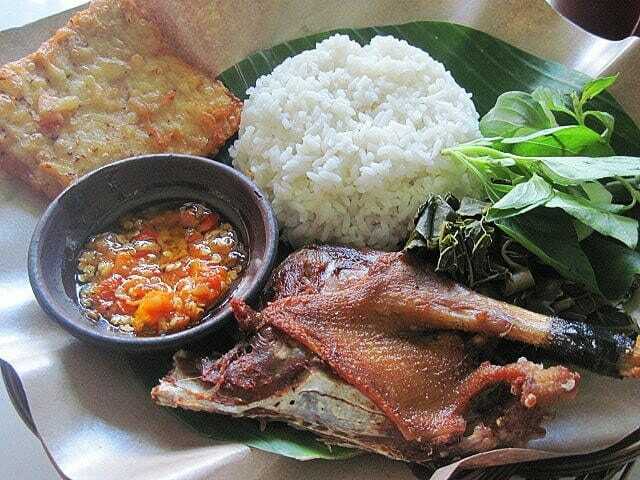 Despite that, in order to get a piece of this fried duck, many locals and tourists often head to the restaurant early in the morning! Sometimes, it gets sold out as early as 10 in the morning! Defintely try the different variety of sambal as it goes extremely well with the crispy duck. For an authentic royal cuisine, head to Bale Roas that serves Javanese food fit for the kings and queens. This restaurant is located in the Palace Complex so you can head over after visiting the palaces. 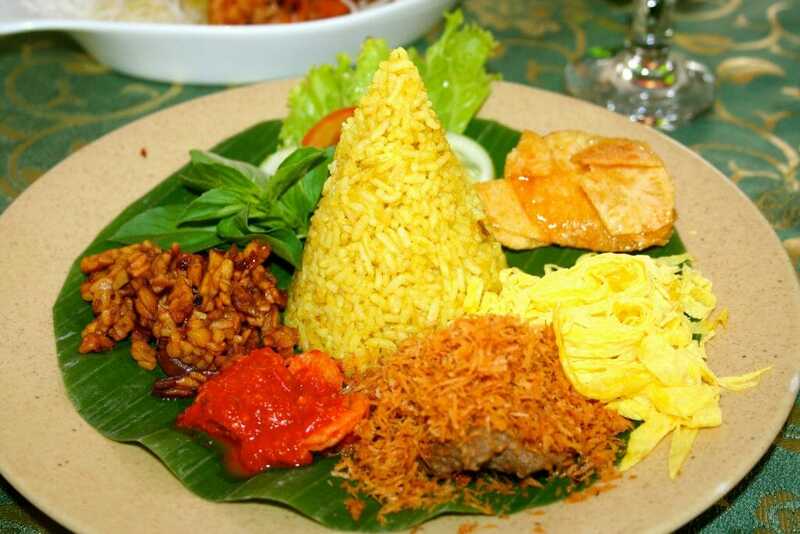 Try the Sekul Jene, which is a yellow rice that is often served during major celebrations. You can order it with various meats like chicken or beef, to your liking. Catfish is a freshwater fish that is caught in local ponds. At Warung Heru, they marinate the fish with a variety of herbs, fry it, before cooking it in coconut milk. Although the picture looks nothing appetising, the result of the complex cooking process is a rich fish stew. They also serve other authentic Javanese dishes such as Nasi Rawon, a strong tasting and flavourful black beef soup. 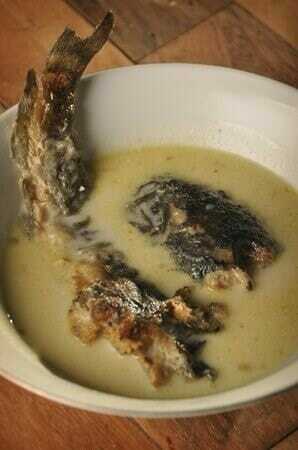 Keluwak nuts are the main ingredients responsible for this black colour seen in the soup.